The 2017 Adequan/FEI North American Junior & Young Rider Championships (NAJYRC) will go down in history as one of the most successful for Canadian athletes to date. During the final day of competition on July 23, 2017, Canada’s up-and-coming stars earned an incredible total of six individual and two team medals. 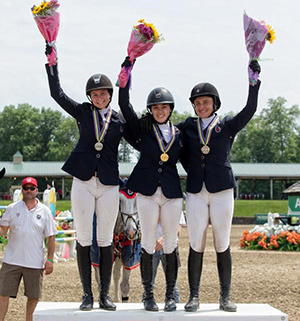 Julia Madigan of Vancouver, BC, Alexanne Thibault of Boucherville, QC and Veronica Bot of Burlington, ON swept the podium in the Young Rider Jumping Individual Final on July 23 at HITS Saugerties in New York. In her inaugural NAJYRC appearance, Madigan, 21, brought home the Individual Gold Medal aboard Farfelu du Printemps (Action Breaker x Darco), a 12-year-old Belgian Warmblood gelding owned by John Madigan. After completing the first three rounds of individual qualifiers, she carried a cumulative score of 8.66 into the Final, which featured an additional two rounds to determine the medalists. Madigan and Farfelu du Printemps put in a fault-free performance in round one, and then returned to lower just one rail for four faults in the second round, bringing their final score to 12.66 for the Gold Medal. Taking the Individual Silver Medal was Thibault, 19, who started strong – winning the First Individual Qualifier on July 20 with Chacco Prime (Chacco Blue x Le Primeur), her nine-year-old Hanoverian gelding. She carried 12 faults forward from the second qualifier, but lowered just one rail over the final two rounds to finish on a score of 16.00. The Individual Bronze Medal went to Bot and Cool Down 3 (Chacco Blue x Lysander), a 10-year-old Hanoverian gelding owned by AEI Corp. Bot, 21, came into the Final on a score of 12.10, and like her teammates, incurred just four faults to take the podium on a final total of 16.10. Canada was also well represented in the top 10 by Jennifer Mattell, 19, from Milton, ON. Riding Cherokee (Cardento x Creool), a 10-year-old Dutch Warmblood gelding owned by Joe Mattell, she had two rails in round one of the Final, but returned to close out NAJYRC on a foot-perfect round for ninth place overall. The majority of the podium was also filled with Canadians in the Children’s Jumping Individual Final, with Anya Bereznicki of Calgary, AB taking Silver and Kyara Semrau of Foothills, AB earning Bronze. Gold was won by Dylan Laiken of USA Zone 10, who finished on zero faults with Callao. Bereznicki, 13, had a remarkable week at NAJYRC. Paired with her nine-year-old Holsteiner mare, Diazella (Diamant de Semilly x Candillo), her sole rail across five rounds of competition came down during the first portion of the two-round Final. After returning to round two to finish on another clear, Bereznicki earned her Individual Silver Medal on a total score of 4.00 faults. Semrau, 14, headed into the Individual Final on a score of five faults from the first three rounds of competition aboard Wings Sublieme (Oklund x Voltaire), a 14-year-old Dutch Warmblood mare owned by Stone Ridge Farms LLC. This proved to be her final score after she became one of only three horse-rider combinations to lay down back-to-back clear rounds in the Individual Final. Two additional Canadian athletes appeared within the top 10 on the Children’s Jumping Individual Final leaderboard. Interestingly, Megan Schlosser of Okotoks, AB and Carly Stevens of Foothills, AB both finished the week on identical scores of 20.00 to tie for ninth place. Schlosser, 14, was partnered with Cassina St. Kriru Z (Cassini II x Poor Boy), her 10-year-old Zangersheide mare, while Stevens, also 14, rode LCC Hello Kate (Luidam x Courage), her nine-year-old Irish Sport Horse mare. Lexi Ray, 18, of Campbellville, ON was Canada’s representative in the Junior Jumping Individual Final. She came into the Final on a score of 14.73 aboard Acita 4 (Acolord x Calando I), a 10-year-old Holsteiner mare she co-owns with Tracy and Robert Ray, and added just four faults over the two rounds for a total score of 18.73 and 10th place. The Junior Jumping Individual Final was won by Nicole Meyer Robredo of Mexico, who earned the Gold Medal on a total of 3.19 faults with Hercule VH End House. Tosca Holmes-Smith, 17, of Chase, BC led Team Canada to a Bronze Medal and claimed the Individual Gold Medal in the CHJ 1* Junior Eventing division at Rebecca Farm in Kalispell, MT on July 23. Riding Fiat (Cats at Home x With Approval), a 13-year-old Thoroughbred gelding owned by her mother, Ali Holmes-Smith, she completed the cross-country and show jumping phases faultlessly, enabling her to finish on her dressage score of 47.2 penalties and land at the top of the podium. Silver went to Alexandra Baugh of US Area VIII and Ballingowan Pizazz (47.7), while US Area VI rider, Mallory Hogan took bronze with a score of 51.0 aboard Clarissa Purisima. Along with teammates, Chloe Duffy, 16, of Sombra, ON, and twin sisters, Ella and Eva Marquis, 14, of Caledon, ON, Holmes-Smith returned to the podium to accept the Team Bronze Medal on a total score of 165.2. US Area VI won Gold with 161.6, and US Area II earned Silver on 164.1. Individually, Duffy incurred no penalties in the jumping phases to finish in fifth place on her dressage score of 52.7 with her 10-year-old Thoroughbred gelding, Oro Veradero. Ella Marquis’ NAJYRC performance was highlighted by a foot-perfect round on cross-country aboard Meadowbrook’s Pollyanna (Pikasso x Jacobean), a 14-year-old Dutch Warmblood/Rhinelander-cross mare owned by Mark Marquis, and she finished in 21st individually. Unfortunately, Eva Marquis did not move forward to show jumping after retiring on cross-country with Hollywood (Theatromania x Jeblar), a 12-year-old Thoroughbred gelding owned by Mark Marquis. On July 20, the duo put a dressage score of 54.3 on the board for their team. The Canadian Young Rider Eventing Team, made up of Anne-Sophie Levesque of Cochrane, AB, Annick Niemuller of Goodwood, ON, April Simmonds of Uxbridge, ON, and Emily Thompson of East Gwillimbury, ON, rode to the Team Bronze Medal in the CICOY 2* Young Rider division on a score of 245.5. US Area I/IV earned Gold with 198.0, with US Area VII bringing home Silver (215.8). The top-placed Canadian was Levesque, 19, aboard her 11-year-old Canadian Sport Horse gelding, Eskapade (Portland L x Golden Art). After a clear cross-country performance, she came into show jumping on her dressage score of 59.5 and added just four penalties for one rail to close out NAJYRC 2017 on a score of 63.5. Simmonds, 19, finished in 12th place overall riding Impressively Done, a 12-year-old Thoroughbred gelding she co-owns with Faydon Enterprises Ltd. Together, they completed show jumping with four jumping and eight time penalties for a total score of 77.5. Niemuller, 18, wasn’t far behind, finishing in 15th place individually aboard FE Black Jack (Blackstone x Severus), a nine-year-old Dutch Sport Horse owned by Karl Niemuller. Unfortunately, Thompson withdrew prior to the show jumping phase. Riding Paddington, a 12-year-old Thoroughbred/Connemara-cross gelding sired by Yavari and owned by Lisa Thompson, she put in strong dressage and cross-country performances for the team, having ranked fourth overall following the first two phases, after scoring 49.4 in dressage, and adding no jumping and just 6.4 time penalties cross-country. The Individual Gold Medalist in the Young Rider division was William Zuschlag of US Area III, who scored 46.2 with RF Southern Command. Incredibly, US Area I/IV rider, Cornelia Dorr took home both the Silver and Bronze medals, riding Louis M and Sir Patico MH on scores of 49.0 and 50.7, respectively. Dressage wrapped up at NAJYRC 2017 at HITS Saugerties with the Junior Rider Freestyle on July 23. Canada’s top-placed athlete was Ava MacCoubrey, 15, of Cobourg, ON. Riding her long-time partner, Pablo (Cordial Medoc x Voltaire), a 20-year-old Dutch Warmblood gelding owned by Lori Bell, she earned a score of 69.050% for seventh place. Allison Youngdale, 17, of Osgoode, ON scored 68.625% for ninth place aboard her 10-year-old Danish Warmblood gelding, Ramiro (Blue Hors Don Romantic x Rambo). The Junior Freestyle was won by Tillie Jones of US Region 4 and Apachi, who scored 73.950%. Silver went to US Region 7 rider, Aleyna Dunn and Bivera (73.450%), and Christian Simonson (US Region 7) took bronze on a score of 70.850%.